When we left Australia, I told God that I was ready to hand back this 'cake thing'. I thanked Him for lending me this wonderful gift if only for a little while. Here you go, God, you can put it back on the shelf now. See you in ten years. You see, I had never planned on starting a cake business. God made it happen and God made it successful. So with plans to serve in Africa, I naively thought what use would cake decorating be in AFRICA?? In my mind the door was closed, or almost. So just in case, I brought along my cake stuff, and enough equipment to run a small workshop. We have only been here 3 months, and so far I have already made two cakes. Four people have enquired about ordering cakes, three of which are not part of the missionary community. More have expressed an interest in learning how to make cakes, and I am making cupcakes for the school PTA Christmas Concert with one Malawian mum already offering to help and learn. WHOA GOD! where are you taking this? I thought I gave it back!! Back on the shelf. or so I thought. On one hand I was quite happy to be rid of the title of 'The Cake Lady'. On the other hand, it gives me great joy to bless others with cake. Ok, so God might want me to use this to bless other missionaries, the expat community, and the few Malawians who can afford to buy decorated cakes. To use cakes as a way of connecting with people. Is that what you want, God? 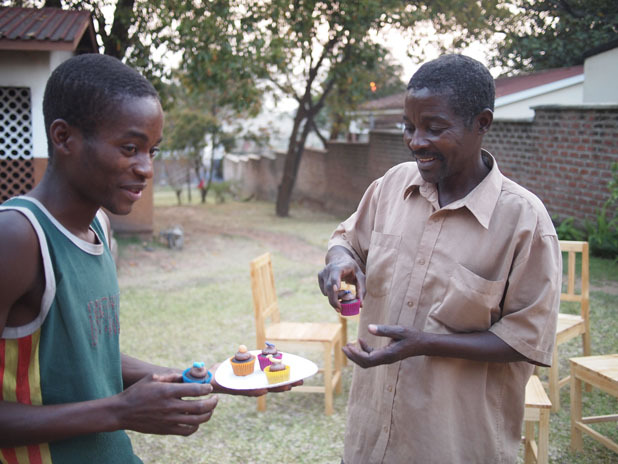 Last week, we learnt from our language teacher that cake is a rare treat for most Malawians. The average Malawian's diet consists mainly of maize, dried fish, and veggies. Ingredients needed for a cake - butter, flour, eggs, milk, and sugar costs way more than they can afford. On top of that, they do not have the equipment to make and bake a cake. And to think that all those times when I had given left over cake and cupcakes to the carpenters, guards, and neighbourhood kids without a second thought. It is truly humbling to think that my left-overs were a rare treat for them. Blessing others with cake has just taken on a whole new meaning here in Africa! But still I wonder, what do you want me to do with this 'cake thing', Lord? It's great to be able to find ur books in our libraries (Singapore)! I'm a cake decorator as well and This post really encourages me. Sometimes we think that a season is coming to an end but God can bring new life into it. Will keep u and your family in prayers. Reading this post made me tear up! I was touched by your submission to God, and His amazing grace that showed you He gave you a gift for a very good reason and it's not going to end just because you left Australia. PTL!